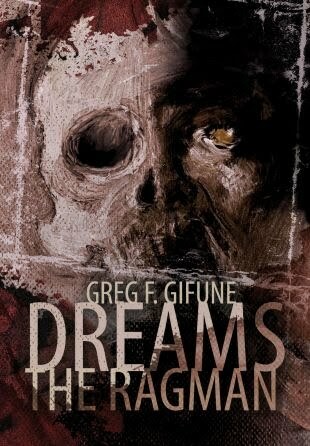 Dreams the Ragman by Greg F. Gifune is another great novella from Delirium Books. As a young boy Derrick listened to his grandfather’s spooky tales of “The Ragman,” an old junk dealer and boogieman of sorts to the children in the neighborhood who he claimed had followed him throughout his entire life and stalked him from the depths of his own worst nightmares. But as an alcoholic ravaged with senility, his grandfather’s stories were dismissed as delusions. Dreams the Ragman chronicles Derrick's lifetime struggle with the mysterious and evil ragman. As a boy, the ragman came for his grandfather. As a teenager, his best friend Caleb. When Derrick begins investigating brutal murders that appear all too familiar, will the ragman come for him, too? I loved the atmospheric and creepy tone of Dreams the Ragman. I found myself engrossed in the suspense and mystery of the ragman. There were times I wished the terror I felt would play out a little longer, but the build up and tension made for a fantastic read. Greg F. Gifune has two novellas in Delirium's 2011 novella series: Dreams the Ragman with an April 2011 release date and Apartment Seven with a September 2011 release date. I will definitely be checking out his next release. Jennifer, I’m a fellow blogger from the BBP. Just wanted to stop by and say thank you for checking out my blog! I always love meeting fellow book lovers and reviewers!